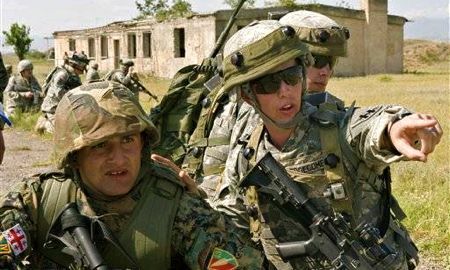 DUSHANBE, Tajikistan — China and several Central Asian nations rebuffed Russia's hopes of international support for its actions in Georgia, issuing a statement Thursday denouncing the use of force and calling for respect for every country's territorial integrity. The Asian alliance also urged all sides to resolve the conflict through "peaceful dialogue." 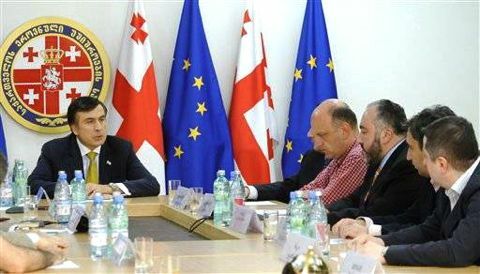 The four Central Asian members of the group — Kazakhstan, Kyrgyzstan, Tajikistan and Uzbekistan — all seemed reluctant to damage their relations with Europe and the U.S.
Kazakhstan enjoys significant Western investment in its rich hydrocarbon sector, and impoverished Kyrgyzstan earns $150 million in aid and rent for hosting a U.S. air base that supports military operations in Afghanistan. 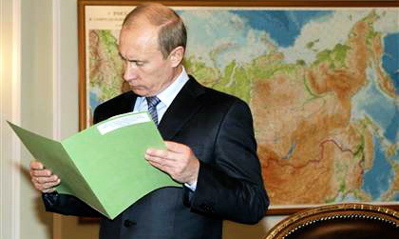 But overall, the summit highlighted Russia's isolation. 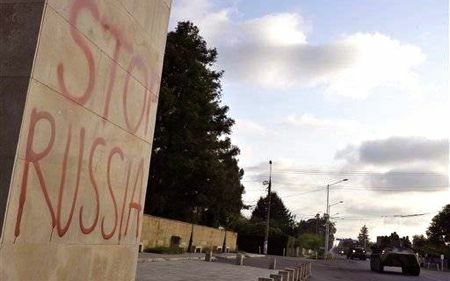 Despite continuing Western protests and a visit by U.S. warships to Georgia's Black Sea coast, Russian troops remain at checkpoints inside areas controlled by Georgia prior to the recent conflict. 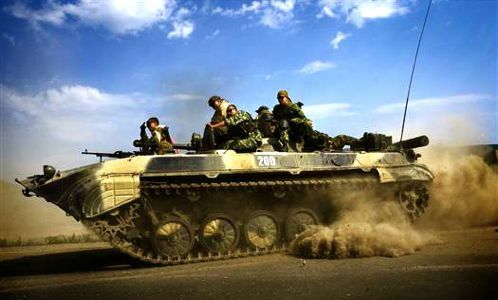 While a cease-fire agreement calls for both sides to withdraw to their previous positions, the Kremlin says the agreement allows Russian forces to occupy "security zones" outside the rebel regions. 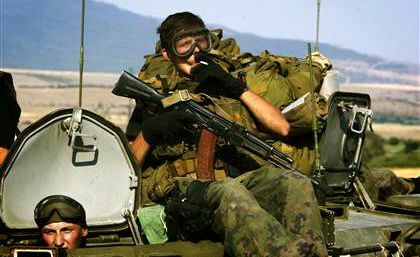 In a rare gesture of conciliation, Russian forces turned over 12 Georgian soldiers on the border of Abkhazia. 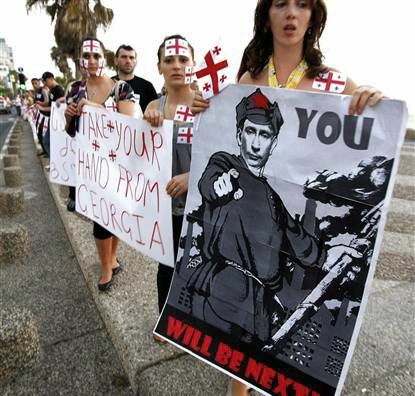 The Georgians were seized Aug. 18 and paraded — blindfolded and hands tied behind their backs — on top of Russian armored vehicles. 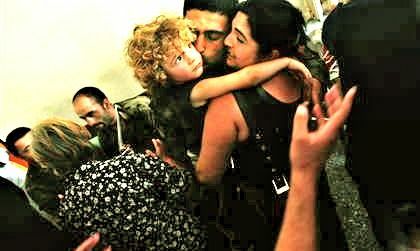 The soldiers appeared unharmed Thursday, and some were smiling. But there was also fresh conflict in the region. 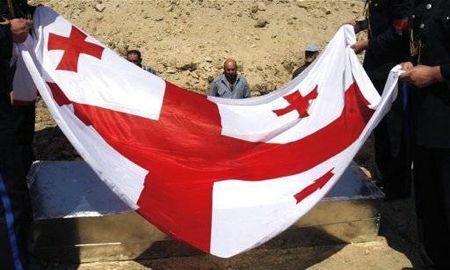 South Ossetia claimed to have shot down an unmanned Georgian spy plane that was scouting the skies over the republic. Georgia denied the report. 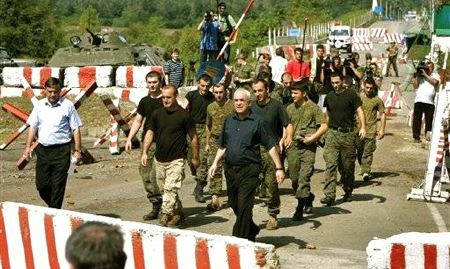 Russia responded to Georgia's military offensive on South Ossetia by sending hundreds of tanks rolling into the rebel region, pushing Georgian troops out of South Ossetia's capital, Tskhinvali, before driving deep into Georgia proper. 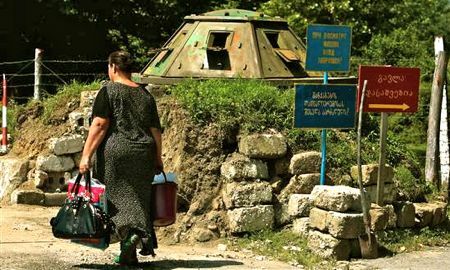 In Vienna, a senior Georgian official said Russian forces and their armed allies have driven all Georgians out of South Ossetia and Abkhazia and were now ethnically cleansing villages in other areas of Georgia. 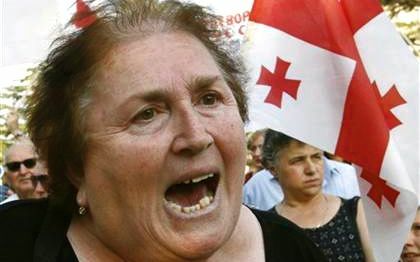 "As of now, we can say with confidence that in both regions — Abkhazia and Ossetia — ethnic cleansing is fully completed," Georgia Foreign Minister Eka Tkeshelashvili told reporters at the Organization for Security and Cooperation in Europe. Russia denied the charge. 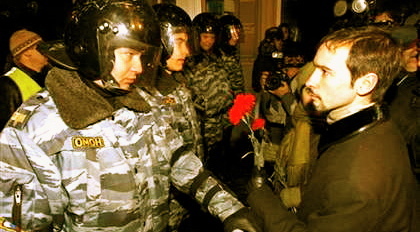 MOSCOW, Russia — Russians were steeled for momentous change at the turn of the millennium. On Dec. 31, 1999, many feared the dreaded Y2K computer bug would hit especially hard at Russia's deteriorating military facilities or its Chernobyl-style nuclear power stations. But the big New Year's Eve surprise was political. 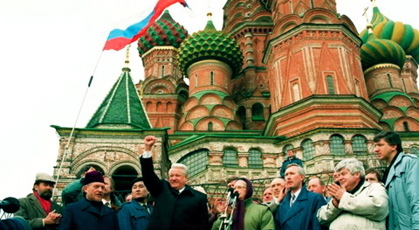 An hour before midnight tolled in Russia's Far East, an ailing Boris Yeltsin went on TV to announce he was resigning and making Vladimir Putin, a former KGB agent, acting president. That set in motion an extraordinary era in Russia history, both for how much the country has moved forward and how far it has stepped back. 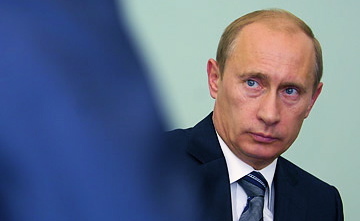 Many Russians were unsure what to expect from a Putin presidency. 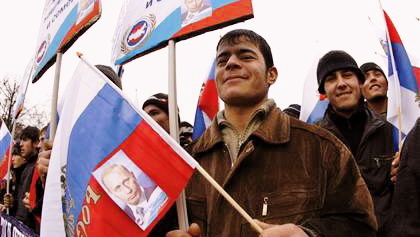 The country was deep in its second war in Chechnya, the ruble had collapsed — and Putin himself had been prime minister less than four months. 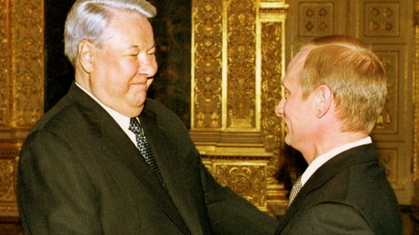 Putin came across as a dull bureaucrat, especially compared with boisterous, hard-drinking Yeltsin. But the next eight years were filled out of the picture. As Russians elect a new president Sunday, an Associated Press correspondent who has covered all of Putin's tenure looks back at its high and low points. 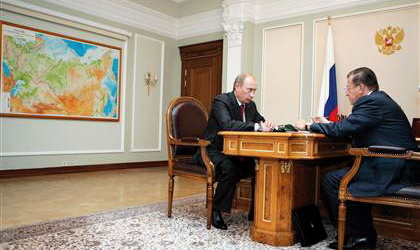 An early surprise came six weeks after Putin became acting president. The new leader sat down with TV reporters at a ski lodge in southern Russia and talked about Russia's tens of billions of dollars in foreign debt. "We have looked like pilferers," he said. It seemed a remarkable moment of candor. The debt was not only paid off, but paid off early. A surprise of a much different sort came that August, when the Kursk nuclear submarine exploded and sank, killing all 118 people aboard. Not only did Russian authorities wait two days to announce the accident, but Putin didn't interrupt his summer vacation to take charge of the disaster. Was he, after all, a Homo Sovieticus, a man stunted by KGB training and conditioned to keep bad news secret? Putin's explanation was that he was afraid he would interfere with the rescue operations — perhaps the only time he has played the role of wallflower. Putin came in for criticism on Russian TV over the Kursk disaster — but the days of independent-minded television were numbered. By the following spring the boldest of the nationwide channels NTV had been forced under the thumb of the state natural gas monopoly. 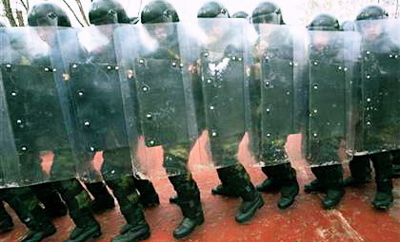 Dissident tycoon Boris Berezovsky soon lost control of two channels. Investigative TV shows disappeared, replaced by movies, game shows and spectacularly tacky variety hours. 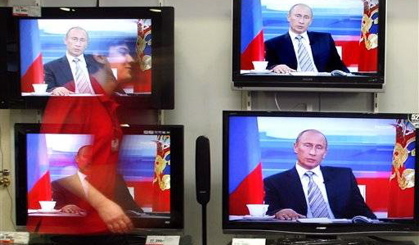 Putin and other Russian officials portrayed the state television takeovers as strictly business matters. The same argument was used for the arrest of Mikhail Khodorkovsky — an oil tycoon and Putin critic — on a Siberian airport's runway. 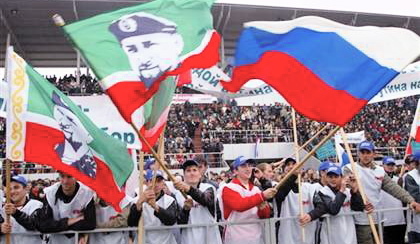 But little of consequence happens in Russia without Kremlin approval, and critics noted that politically compliant moguls weren't under pressure. MOSCOW, Russia — Vladimir Putin's handpicked successor Dmitry Medvedev was cruising to an easy victory in Russia's presidential election Sunday, a result expected to give significant power to the outgoing president. 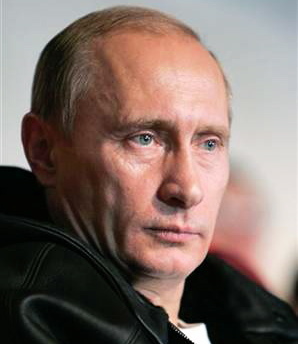 No one is born with a stare like Vladimir Putin's. 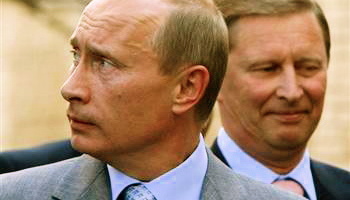 The Russian President's pale blue eyes are so cool, so devoid of emotion that the stare must have begun as an affect, the gesture of someone who understood that power might be achieved by the suppression of ordinary needs, like blinking. The affect is now seamless, which makes talking to the Russian President not just exhausting but often chilling. It's a gaze that says, I'm in charge. This may explain why there is so little visible security at Putin's dacha, Novo-Ogarevo, the grand Russian presidential retreat set inside a birch- and fir-forested compound west of Moscow. 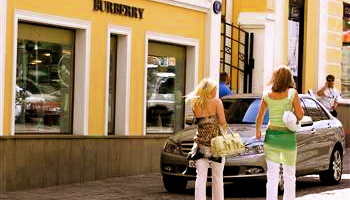 To get there from the capital requires a 25-minute drive through the soul of modern Russia, past decrepit Soviet-era apartment blocks, the mashed-up French Tudor-villa McMansions of the new oligarchs and a shopping mall that boasts not just the routine spoils of affluence like Prada and Gucci but Lamborghinis and Ferraris too. The rooms feel vast, newly redone and mostly empty. 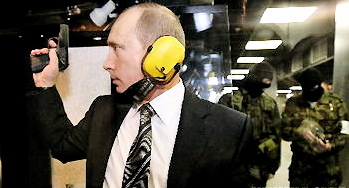 As we prepare to enter his spacious but spartan office, out walk some of Russia's most powerful men: Putin's chief of staff, his ideologist, the speaker of parliament—all of them wearing expensive bespoke suits and carrying sleek black briefcases. 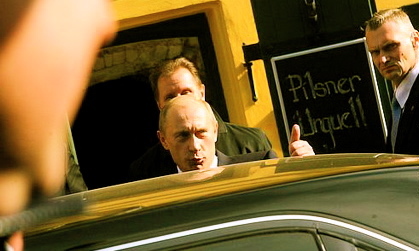 Putin, who rarely meets with the foreign press, then gives us 3-1/2 hours of his time, first in a formal interview in his office and then upstairs over an elaborate dinner of lobster-and-shiitake-mushroom salad, "crab fingers with hot sauce" and impressive vintages of Puligny-Montrachet and a Chilean Cabernet. 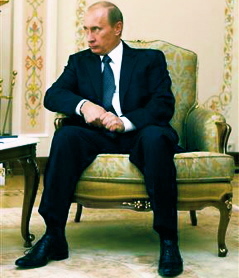 Vladimir Putin gives a first impression of contained power: he is compact and moves stiffly but efficiently. He is fit, thanks to years spent honing his black-belt judo skills and, these days, early-morning swims of an hour or more. And while he is diminutive—5 ft. 6 in. (about 1.7 m) seems a reasonable guess—he projects steely confidence and strength. 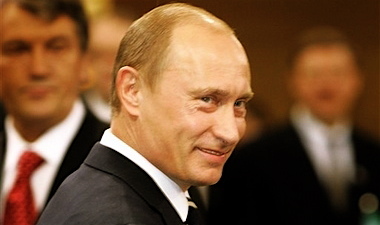 Putin is unmistakably Russian, with chiseled facial features and those penetrating eyes. Charm is not part of his presentation of self—he makes no effort to be ingratiating. One senses that he pays constant obeisance to a determined inner discipline. 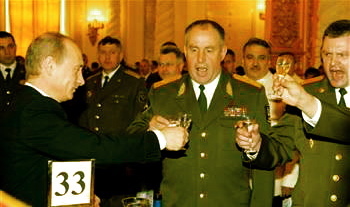 The successor to the boozy and ultimately tragic Boris Yeltsin, Putin is temperate, sipping his wine only when the protocol of toasts and greetings requires it; mostly he just twirls the Montrachet in his glass. He eats little, though he twitchily picks the crusts off the bread rolls on his plate. 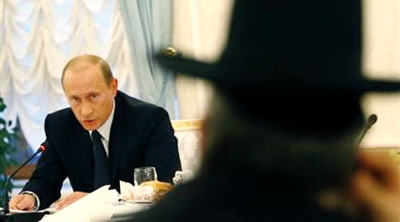 Putin grudgingly reveals a few personal details between intermittent bites of food: He relaxes, he says, by listening to classical composers like Brahms, Mozart, Tchaikovsky. His favorite Beatles song is Yesterday. He has never sent an e-mail in his life. And while he grew up in an officially atheist country, he is a believer and often reads from a Bible that he keeps on his state plane. He is impatient to the point of rudeness with small talk, and he is in complete control of his own message. 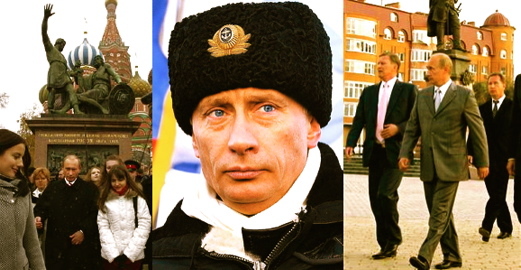 His final year as Russia's President has been his most successful yet. At home, he secured his political future. Abroad, he expanded his outsize—if not always benign—influence on global affairs. In a year when Al Gore won the Nobel Peace Prize and green became the new red, white and blue; when the combat in Iraq showed signs of cooling but Baghdad's politicians showed no signs of statesmanship; when China, the rising superpower, juggled its pride in hosting next summer's Olympic Games with its embarrassment at shipping toxic toys around the world; and when J.K. Rowling set millions of minds and hearts on fire with the final volume of her 17-year saga. One nation that had fallen off our mental map, led by one steely and determined man, emerged as a critical linchpin of the 21st century. 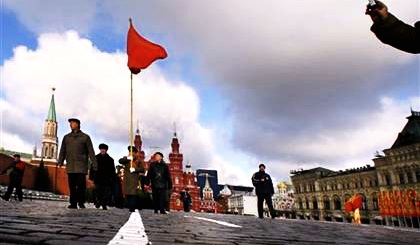 Russia lives in history—and history lives in Russia. 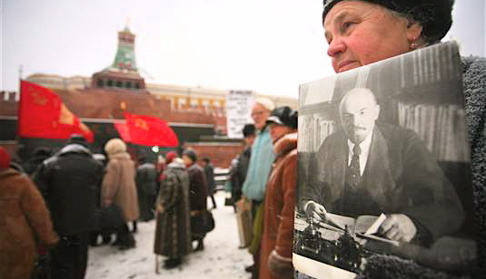 Throughout much of the 20th century, the Soviet Union cast an ominous shadow over the world. It was the U.S.'s dark twin. But after the fall of the Berlin Wall, Russia receded from the American consciousness as we became mired in our own polarized politics. And it lost its place in the great game of geopolitics, its significance dwarfed not just by the U.S. but also by the rising giants of China and India. That view was always naive. 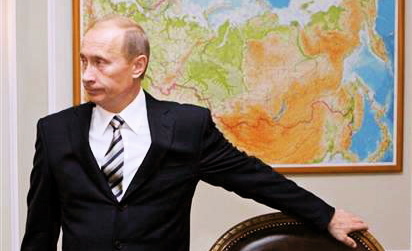 Russia is central to our world—and the new world that is being born. 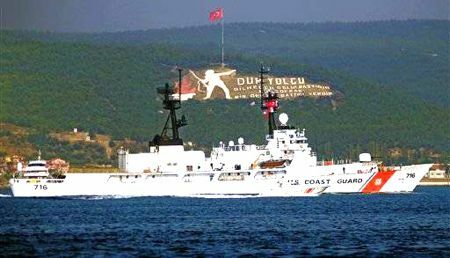 It is the largest country on earth; it shares a 2,600-mile (4,200 km) border with China; it has a significant and restive Islamic population; it has the world's largest stockpile of weapons of mass destruction and a lethal nuclear arsenal; it is the world's second largest oil producer after Saudi Arabia; and it is an indispensable player in whatever happens in the Middle East. 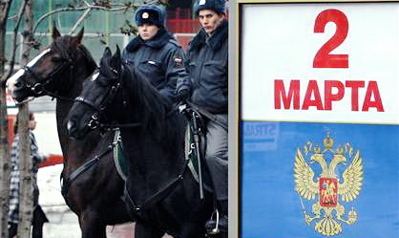 For all these reasons, if Russia fails, all bets are off for the 21st century. And if Russia succeeds as a nation-state in the family of nations, it will owe much of that success to one man, Vladimir Vladimirovich Putin. No one would label Putin a child of destiny. The only surviving son of a Leningrad factory worker, he was born after what the Russians call the Great Patriotic War, in which they lost more than 26 million people. The only evidence that fate played a part in Putin's story comes from his grandfather's job: he cooked for Joseph Stalin, the dictator who inflicted ungodly terrors on his nation. 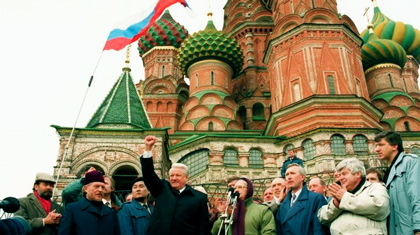 When this intense and brooding KGB agent took over as President of Russia in 2000, he found a country on the verge of becoming a failed state. 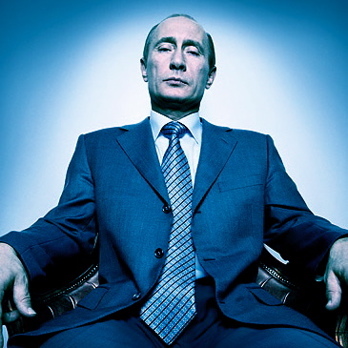 With dauntless persistence, a sharp vision of what Russia should become and a sense that he embodied the spirit of Mother Russia, Putin has put his country back on the map. And he intends to redraw it himself. Though he will step down as Russia's President in March, he will continue to lead his country as its Prime Minister and attempt to transform it into a new kind of nation, beholden to neither East nor West. 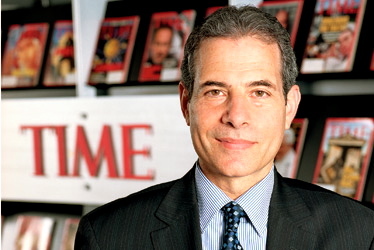 TIME's Person of the Year is not and never has been an honor. It is not an endorsement. It is not a popularity contest. At its best, it is a clear-eyed recognition of the world as it is and of the most powerful individuals and forces shaping that world—for better or for worse. It is ultimately about leadership—bold, earth-changing leadership. 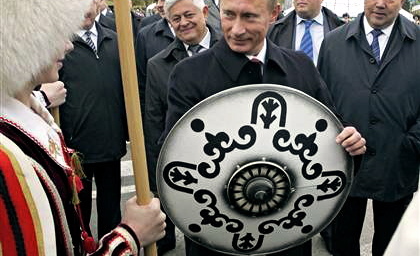 Putin is not a boy scout. He is not a democrat in any way that the West would define it. He is not a paragon of free speech. He stands, above all, for stability—stability before freedom, stability before choice, stability in a country that has hardly seen it for a hundred years. Whether he becomes more like the man for whom his grandfather prepared blinis—who himself was twice TIME's Person of the Year—or like Peter the Great, the historical figure he most admires; whether he proves to be a reformer or an autocrat who takes Russia back to an era of repression—this we will know only over the next decade. At significant cost to the principles and ideas that free nations prize, he has performed an extraordinary feat of leadership in imposing stability on a nation that has rarely known it and brought Russia back to the table of world power. 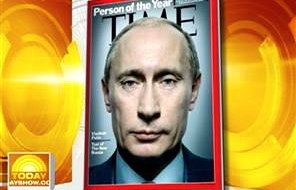 For that reason, Vladimir Putin is TIME's 2007 Person of the Year. MOSCOW — Dmitry Medvedev, the hand-picked candidate to succeed President Vladimir Putin, called Tuesday for Putin become prime minister after the March 2 election. Putin is prohibited by law for running for a third consecutive term, but clearly wants to retain a powerful role once he steps down. 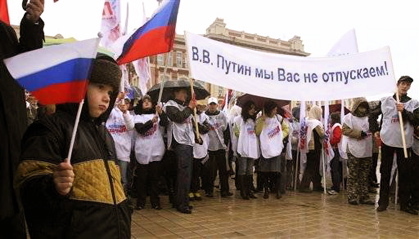 Medvedev's proposal would provide such a role, especially if the constitution were amended to increase the prime minister's powers — which could be done readily with the new parliament dominated by pro-Putin politicians. 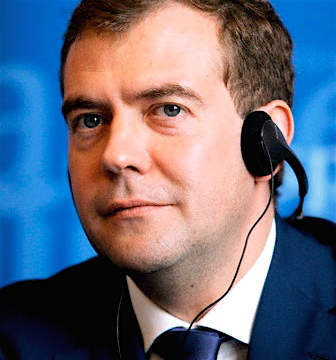 Medvedev, 42, has spent most of his career as a loyal comrade of Putin, and his proposal for him to become prime minister almost certainly was made with prior consultation with the president. "Having expressed my readiness to run for president of Russia, I appeal to (Putin) with a request to give his principal agreement to head the Russian government after the election of the new president of our country," Medvedev said in televised address a day after Putin endorsed his candidacy. 3. 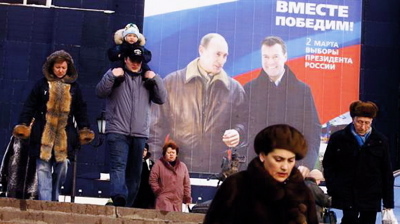 "Pursuit of Putin Policy"
Putin's support for Medvedev virtually ensures that he would win the election. Medvedev also said that after the election, Russia must continue to pursue the policies driven by Putin in the past eight years. 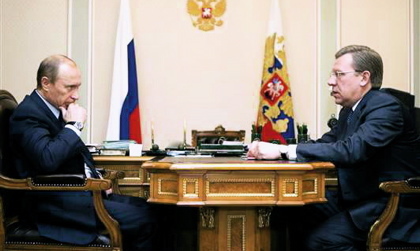 Medvedev's support for Putin's policies and his proposal that he become prime minister were sure to raise questions of whether he would be a genuinely independent president or essentially a figurehead, doing Putin's bidding. Medvedev, who projects a milder and more sympathetic image than the steely and often sardonic Putin, nonetheless echoed the prickly national pride and distrust of the West that characterize Putin's public statements. 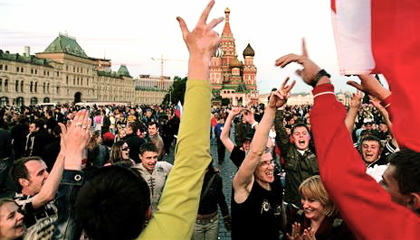 "The world's attitudes toward Russia has been changed. They don't lecture us like schoolchildren. They respect us and they reckon with us. Russia has been returned to its overwhelming position in the world community," Medvedev said in a three-minute statement broadcast on state television. 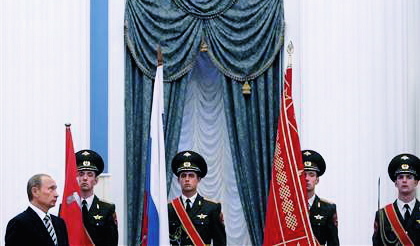 He also praised efforts under Putin to restore the country's armed forces after years of post-Soviet neglect and underfunding, saying "Our military defense and security have been increased." 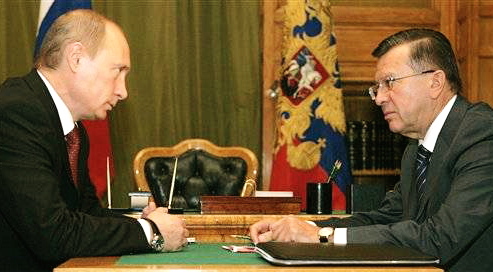 Despite the assertion of surging military might, Medvedev is not considered a Kremlin hard-liner, in contrast with the others who had vied for Putin's endorsement, chiefly fellow First Deputy Prime Minister Sergei Ivanov. 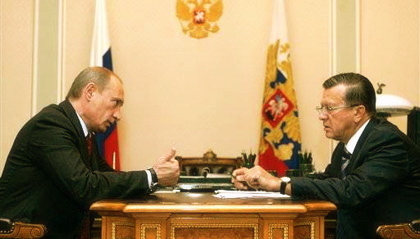 Both Medvedev and Putin worked under St. Petersburg's reformist Mayor Anatoly Sobchak in the early 1990s. 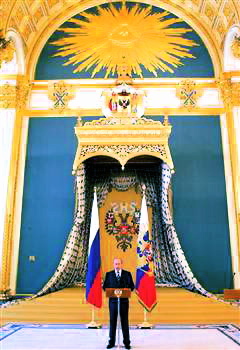 After Putin became prime minister in 1999, he brought Medvedev to Moscow to become deputy chief of staff of the Cabinet. 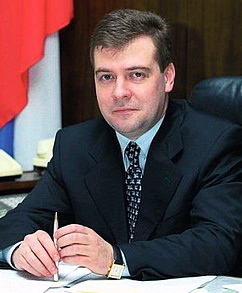 He then moved up to become deputy chief of staff for the president, was appointed to head the board of state natural gas giant Gazprom in 2002 and became full presidential chief of staff in 2003. 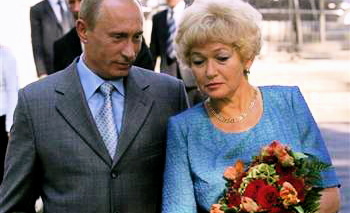 In 2005, Putin named him a first deputy prime minister. "As Putin Goes By.... プーチンの過ぎゆくままに"
President Vladimir Putin on Monday expressed support for First Deputy Prime Minister Dmitry Medvedev as his successor — a move likely to ensure Medvedev's election. There have been months of intense speculation on whom Putin saw as his likely successor in the March 2 voting, along with the wider question of what Putin himself will do once he steps down. Putin's popularity and steely control is so strong that most observers expect that whomever he supports would be a shoo-in. He made the statement in a meeting with representatives of the United Russia party — which is his power base and dominates parliament — and of three other parties. 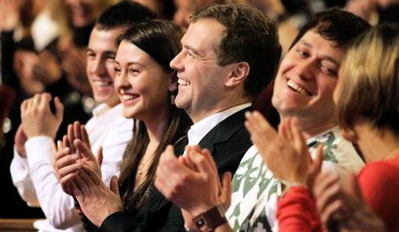 The parties told Putin they all supported Medvedev. 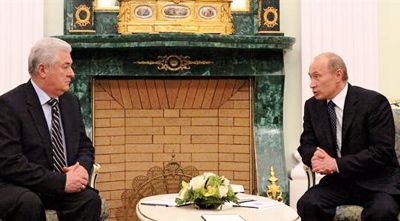 "I completely and fully support this proposal," Putin said, according to footage shown on state television. 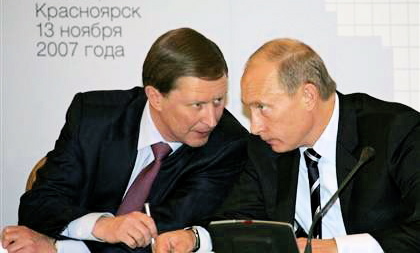 Putin had long been seen as trying to choose between Medvedev, a 42-year-old business-oriented lawyer and board chairman of state natural gas giant Gazprom, and Sergei Ivanov, another first deputy premier who built up a stern and hawkish reputation while defense minister. 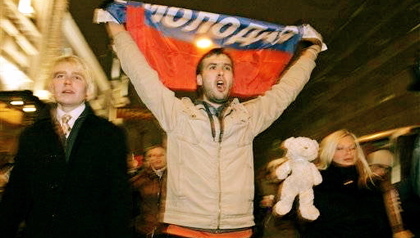 "Medvedev is not an extremist. 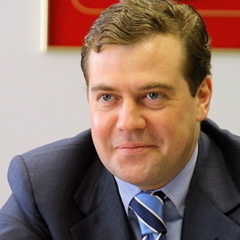 He is not known for any kind of harsh views on politics, and apparently Medvedev better suits Putin's view of how to achieve continuity," said Lilia Shevtsova, an analyst at the Carnegie Moscow Center. 4. 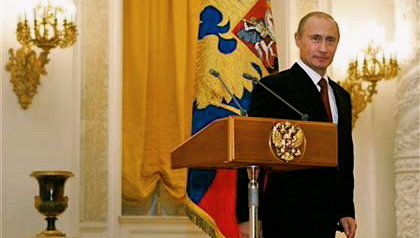 Post-Putin: a 'national leader' ? Although Putin is banned by the constitution from seeking a third consecutive term in office, he has indicated a strong desire to remain a significant power figure. He has raised the prospect of becoming prime minister, and his supporters have called for him to become a "national leader" with unspecified authority. Although he holds powerful positions, Medvedev projects a mild-mannered public image and has been widely seen as a functionary devoted to Putin rather than as an independent thinker. Putin reinforced that perception Monday by saying that electing Medvedev would pave the way for a government "that will carry out the course that has brought results for all of the past eight years." 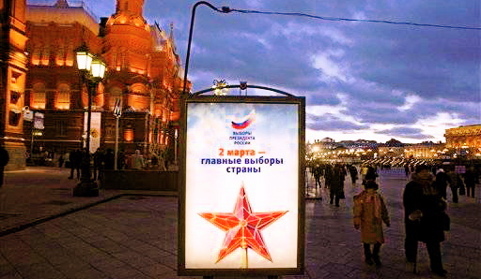 The Russian stock market surged on the news, led by Gazprom, whose shares jumped 1.6 percent within a few minutes. 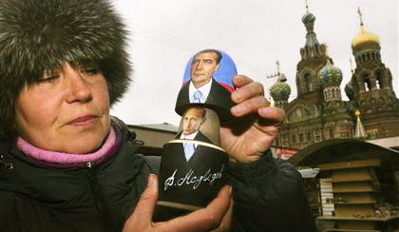 The market also apparently was boosted by the end of long uncertainty over whom Putin would designate as successor. 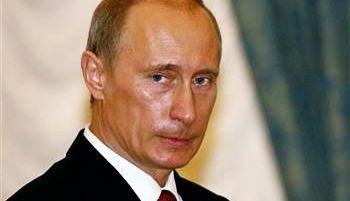 The speculation about Putin's future has included the possibility that he could try to return as president.